New Stuff - large update today! Another big update - I sure have been busy! Three new paintings to show you today - "Ossuary: The Collector" , "Faces of Faery #225" and "Faces of Faery #226" also a work-in-progress shot of "Eve and Rib". Also a reminder - the Kansas City Renaissance Festival has opened for the season! I will be there in person September 27 & 28, and October 4 & 5, and the rest of the time my sister Amber & her family will be running my gallery - loads of art & merchandise there (whether I'm there or not, hehe). Click HERE for details about the show! 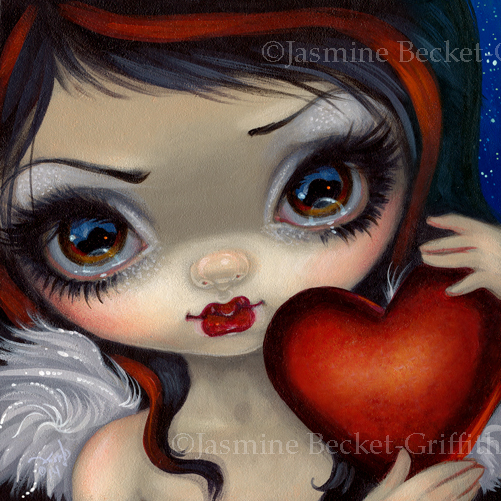 This weekend is Pet Fest - anybody who brings their pet to our store (Strangeling: The Art of Jasmine Becket-Griffith #251 - right down the path from the Joust) will get a FREE MINI PRINT! 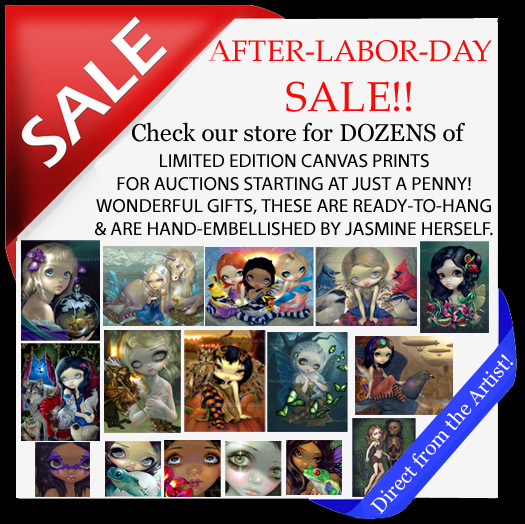 And in other great news - it's the traditional Week-After-Labor-Day-Weekend Canvas Sale! Since I'm always busy with Dragon*Con on the "real" Labor Day weekend, I follow up the following week with a whole bunch of "penny auctions" for select Lt. Ed. Canvases. Each starts at a penny a lot of my favourites - click HERE to see them all, they are up for auctions ending on Monday, September 15. 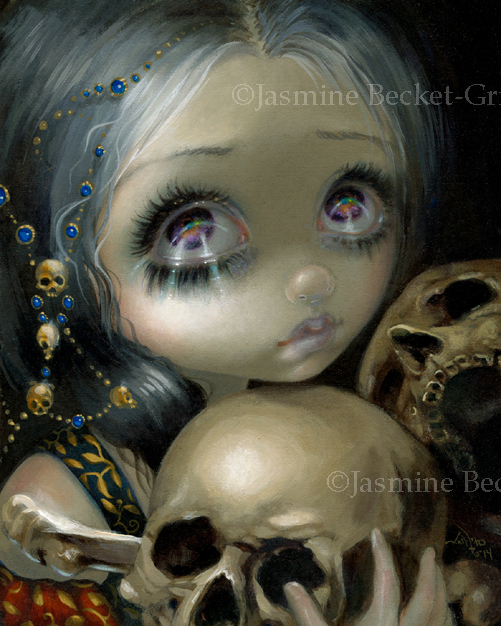 The first painting in a series called "Ossuary" - I debuted & sold this piece for the Dragon*Con 2014 Art Show. Each painting in my Ossuary focuses on the beauty of bones. Traditionally, an ossuary is a storage place specifically for bones, and they make a definite appearance in "The Collector" - a tragically sad looking big eyed girl gathering together some ancient skulls. There is no doubt a story behind this one. 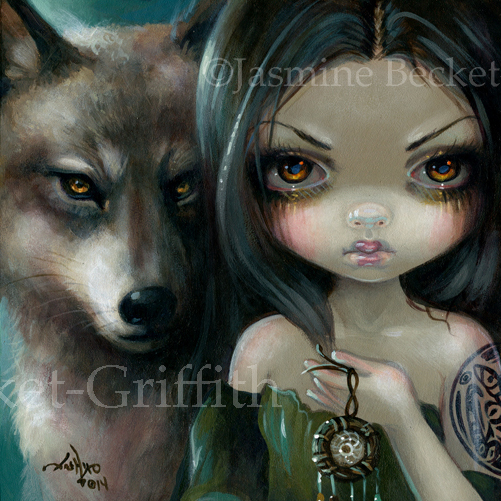 The original piece sold at the show, but prints & canvases are available! A great opportunity to begin your collection, or to add to it with your favourites - at a potentially great bargain! If you haven't ever purchased a Limited Edition Canvas print from me, I highly recommend them - they are truly the next best thing to owning one of my original paintings. In fact, I hand embellish each one with my own acrylic paints & brush, adding small details, highlights, strands of hair, extra flowers, etc. so each one is unique and hand accented by me, the artist. Each is also signed, dated, numbered (only 25 of each is ever made) and inscribed by hand on the back by me with authentification information. They come "ready to hang" - wrapped on boards, glossily finished, archivally printed with 100-200+ year inks. Each one has a hanger on the back so you don't have to frame them - you can just hang them on a nail right on your wall as soon as you get it home! Again - the sale ends on September 15 when all of the auctions end. Click HERE to see all of the penny auctions included in the sale! Work-in-progress! I'm working on the sequel to my "Strangeling" book, again featuring short stories - piece I'm painting now is an illustration for Matthew David Becket's (my husband - check him out on Facebook HERE) short story (which will be published in the book, along again with stories by my sisters / co-authors Kachina Mickeletto & Amber Logan). The book will be out 2015 and is published by Blue Angel. 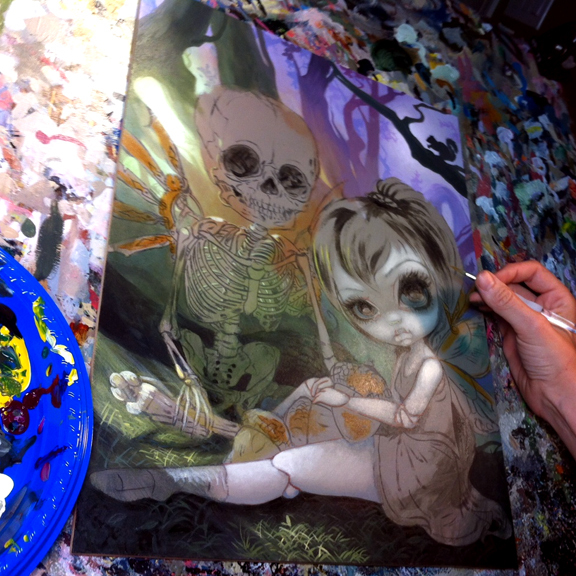 This painting is called "Eve and Rib" - a clockwork fairy and her animated skeleton boyfriend in the forest - a lovely story indeed. The same characters appear in the book Matt recently finished (yet unpublished). This original painting is available for sale - if you are interested in purchasing it, email me at JasmineToad@aol.com with the subject line "Eve and Rib Original" - it is 12x16 acrylic on panel, will come in a spectacular ornate frame, and will be priced at $4400. Prints & canvases will be at strangeling.com soon! More details about the new Strangeling book will follow soon (and if you haven't already gotten the first Strangeling art book, go get it - deluxe hardcover version is at Amazon here and autographed copies at Strangeling.com too).